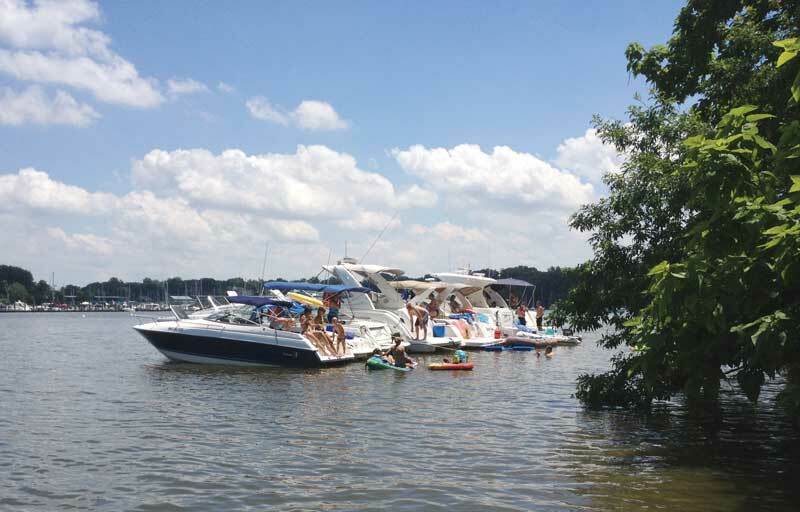 To help our readers breeze through the dog days of summer, we’ve compiled a Summertime Survival Guide for Bay boaters. Keep these tips in mind to stay safe and cool as you enjoy time on the water. Whether it’s a lotion, spray, or protective clothing, boaters need to block the sun’s harmful rays. Look for sunscreen that is labeled “broad spectrum,” SPF 30 or higher, and water resistant. For more on sunscreens, check out the American Academy of Dermatology’s advice at aad.org. For those who don’t want to slather or spray, high-tech fabrics are a great option. We’ve found the high-quality products to be the most comfortable. Well-made items can cover head, neck, ears, arms, and trunk without trapping too much body heat. Don’t forget sunglasses too. Spotting navigational markers will be easier if they’re polarized. Stopping by the convenience store to pick up a bag of ice on the way to the marina is second nature for most of us. Ice keeps food fresh, beverages cool, and can cool down the body quickly if a crewmember or guest gets overheated. Outfitting the cockpit area with a bimini will provide shade while underway, and a planned stop at a marina or anchorage during the heat of the day will give everyone a chance to cool off with a swim. Speaking of swimming, there’s no doubt nettles are a nuisance in mid- to late-summer. Nettle Nets provide a protective barrier around swimmers. Anti-jellyfish lotion is another option. Ever tried one? Let us know the results. The sting from these creatures is caused by venom from their tentacles. There are dozens of home-spun treatments. Scraping them off with a credit card, rinsing with urine, and applying ice come to mind. But experts generally suggest removing tentacles with a tweezers, rinsing with vinegar, and applying heat. Stow bug spray to banish mosquitos and other unwelcome guests at sunset cruises and dockside parties. A combination bug repellent and sunscreen can protect skin with a one-two punch. Our readers love their boat dogs, so prepare for their comfort too. 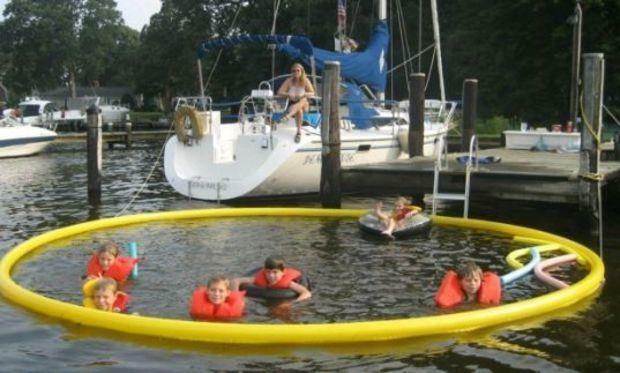 Consider installing netting from the grab rails to the deck to help prevent slipping (or jumping) off the boat. Make sure there’s some non-skid surface space for good traction, and devise a response plan for a doggy overboard situation. Also, invest in a dog-specific PFD. Bring dog snacks and plenty of water, and keep a potty mat aboard for emergencies.